SunnyGal Studio Sewing: Burda 06/2016 # 105: Pattern love! 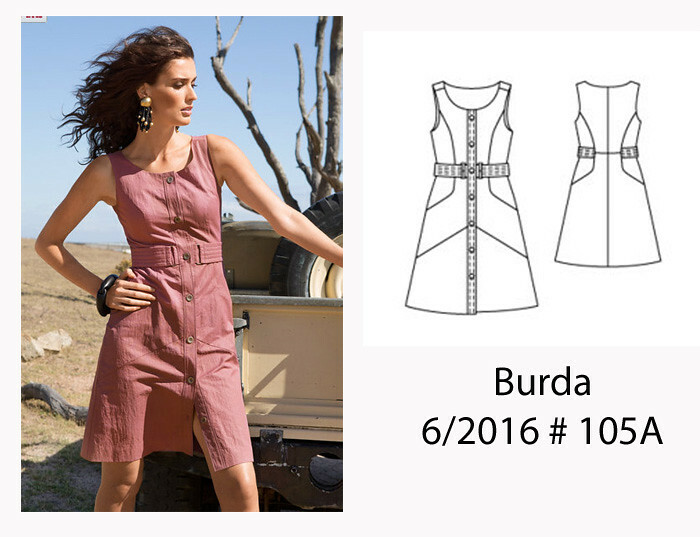 Burda 06/2016 # 105: Pattern love! What is that mysterious combination that makes a perfect garment? Oh I don't mean perfect in execution, or perfect in fit, or perfect in style of the moment? If we could bottle that particular brand of alchemy then we would never have some sewing project that is completed and then languishes in the back of the closet, rarely worn. This dress is going to have a life different than that - no languishing in the wardrobe. It will be worn. And me with a goofy smile all summer. Yes it is kind of simple - but maybe the best things are simple. Something I usually know but have trouble putting into action. So why do I love this dress? It sewed together like a dream. Which might seem surprising considering all the pieces. I did have to do some fitting. Starting with size 38, I added 1" to the length of the bodice, basted the skirt on and then moved it back up 1/2", so that means in the final analysis I added 1/2" to the bodice. I added 1" on the side seam of all the pieces and then I didn't need it at all in the top half of the dress and definitely needed it around the hips. 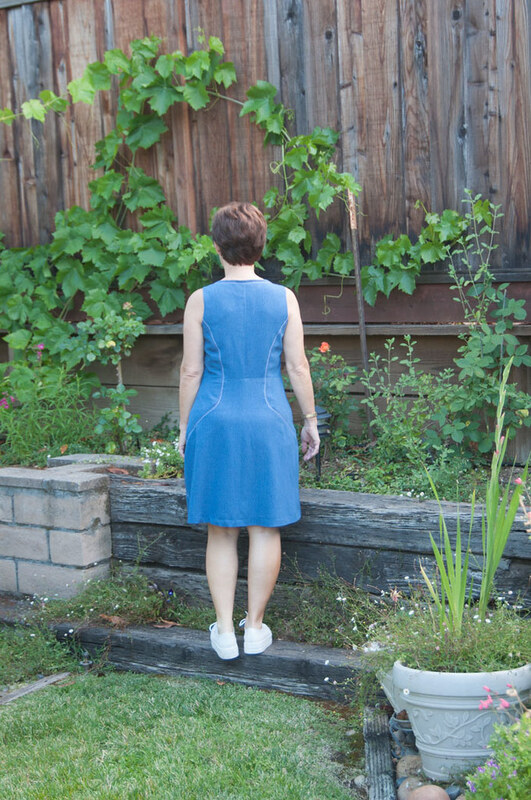 I tweaked the side seam from top to bottom to get a nice fit (which is why I always sew the whole front and whole back and then play with the side seam. I did make a bodice only muslin of this before starting, so I could check the fit in the bust and it seemed good. But the neckline was too big so I pinched out a bit in the front neckline and also took the center back seam in a good inch. Now it comfortably fits my shoulders etc. Goofing around shot :) Included so you can see the various angles pieces. Are you slightly mystified by my inconsistent topstitching? Me too. 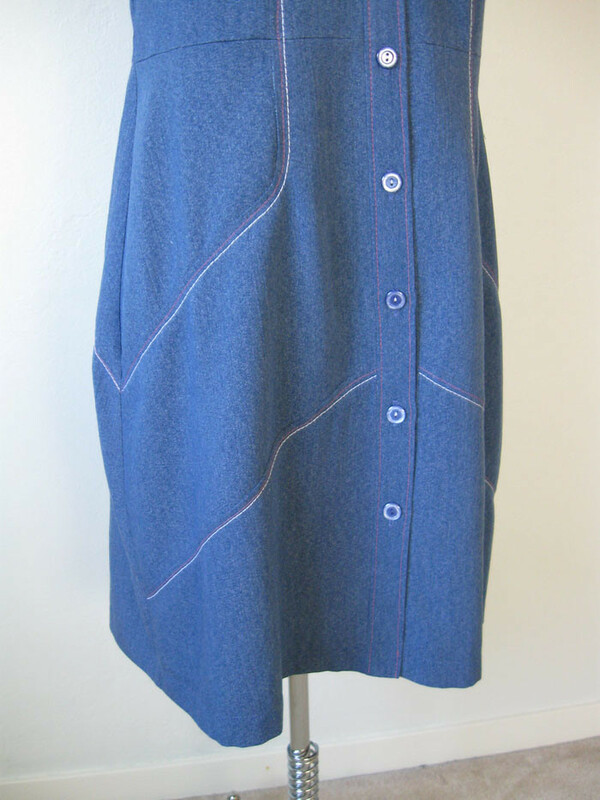 I first did the pink topstitching as long ago I had another perfect denim dress that had rose pink stitching, so I thought I would try it here. And I did but it hardly showed. Well I was not going to remove that so I put another row in white - and since the only actual topstitching thread that I have is white it turned out quite well. But i wasn't going to topstitch the placket - I think that would have been a bit too much. Or maybe not. In any case it is a design element - for this version. And the buttonholes are in blue thread. What a thread rebel I am, Ha! A few techniques on display. 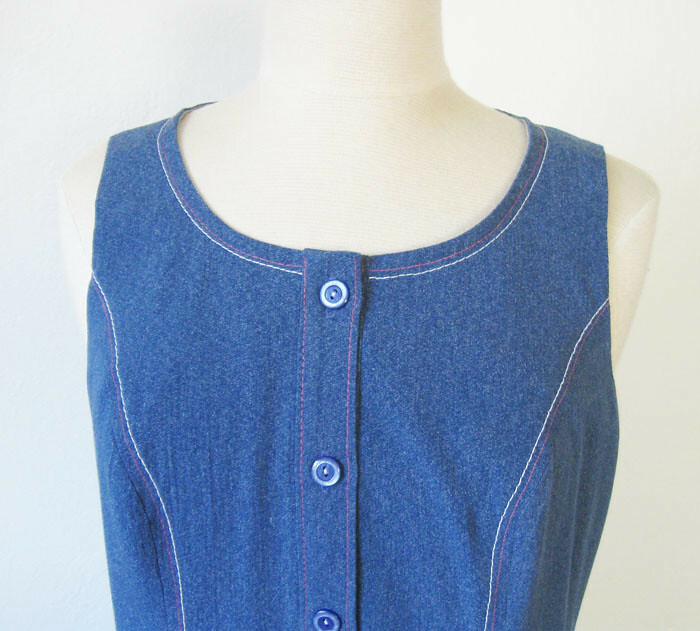 Note how the bottom of the dress meets at the button placket. That is definitely one of my pet peeves, if the hem of the underneath portion sticks out below the upper portion. 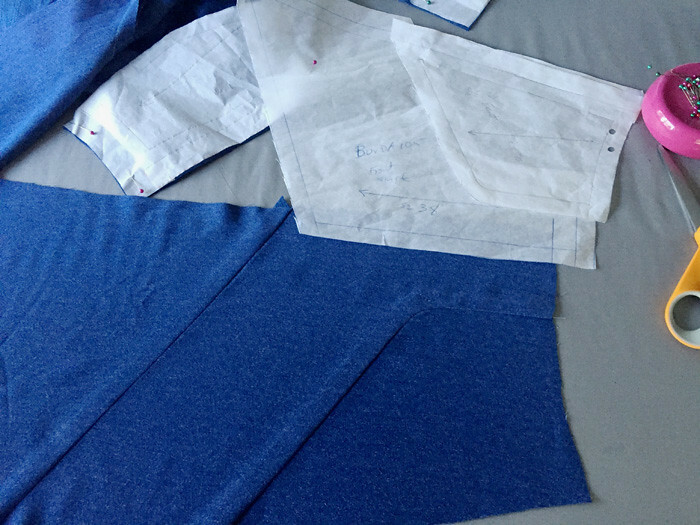 Also I am quite happy how all the seam lines match up - that is due to the very nice pattern and then accurate sewing. My only quibble is the back does not have the same amount of angled sections as the front. Nakisha asked me on IG what size these buttons were, and I just measured, they are 5/8". Something I bought last week as Joann's had a 60% off all buttons sale so I scooped up a bunch in various basics. I can't stand to have a project finished all but for the buttons so it pays to stockpile some useful colors. Here is the Burda image and tech drawing. Slightly surprising that I wanted to make this dress as the color they chose is not at all something that would catch my eye. Plus it looks kind of wrinkled, I think it is a stiff or even coated cotton. But those angles on the drawing got me. This time I didn't take any in progress pics. To tell the truth I was kind of thinking this would be a muslin. Not! Just one to show the pattern pieces. If you make this be sure to LABEL the various pieces, after you cut them out they kind of look similar but probably would mess it up considerably if you sewed the back upper triangle piece on the front or something like that. And you can see I omitted the belt. It just seemed unnecessary. Stitcher's choice, right? One more picture for good measure. 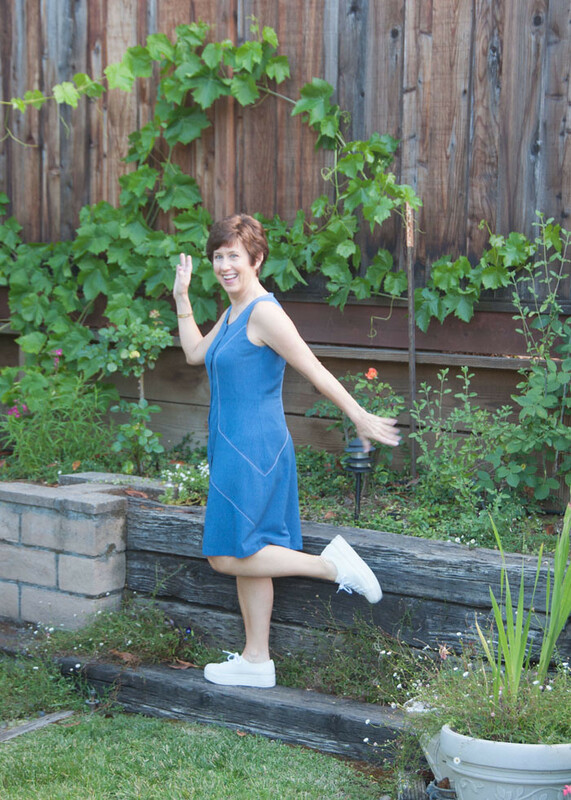 I think this is how I might like to spend my summer - in a cool and comfortable denim dress, wearing white sneakers and a ray of sunshine following me around. Does this dress make you think of baseball? something about topstitching and the seams make me think of the stitching on a baseball. Which I guess is not a bad thing in the summertime! Go Giants! And my post yesterday is a giveaway for a couple of US envelope patterns - drawing for international readers only this time so check it out if you would like to put your name in. 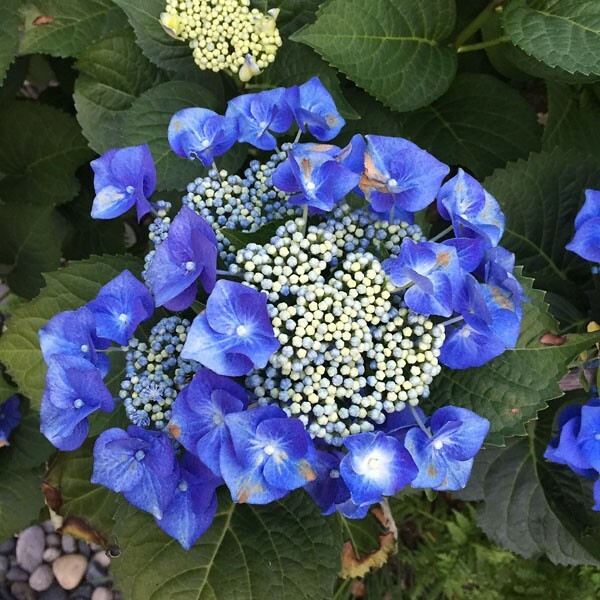 today's garden photo - this is a giant (and I do mean giant) hydrangea that lives at the front of the house. I never dreamed it would get so big, and it always tries to crowd out the two on either side, which are the mophead variety that I prefer. but the blue is so nice! Perfect FIT as always. Looks great. Very nice dress!Lovely! The fit is perfect and I like the color a lot too. This is so cute on you! I'm thinking of downloading this pattern. It is my favorite from this month's Burda. I can see why you like it, Beth. It's very cute and strikes that perfect balance of casual and pulled together. What a fun dress! I love the topstitching design. Love this dress!! I was looking through some of my old Burdas ( year 2000 to present) and found so many great styles that are so on trend right now. Much better than the current issues. I wasn't taken by this dress when I first saw it in the mag but after seeing your creation, I had a total change of heart. This is a fabulous dress and I can see why you like it so much. 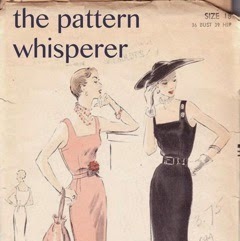 Already said it: wish this (and lots of other) burda patterns were done in the plus sizes. This is so cute! Have been waiting for this post Beth. Absolutely love the dress. Absolutely love your blog actually! 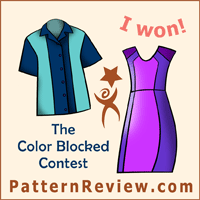 What a great dress! Your fit is amazing, and it looks so comfy! Love this! The seam lines are so cool and I adore how you highlighted them with that double topstitching!! I like your version so much better than Burda Style's. Wow! The fit on that is perfect. I don't understand why Burda's version didn't play up the style lines more on theirs either as yours look great. Love your dress Beth. It looks very comfortable. I am disappointed because they don't do my size. I was wondering if the pattern sizes in the magazine are different from the download. 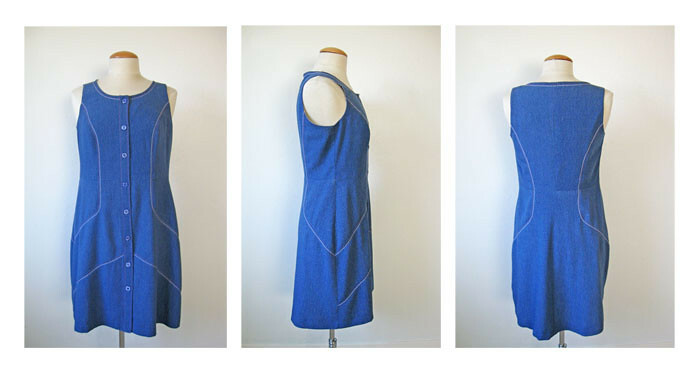 Nakisha (Sew Crafty Chemist) just IG'd this dress, and I wanted to track it down...what a timely post! 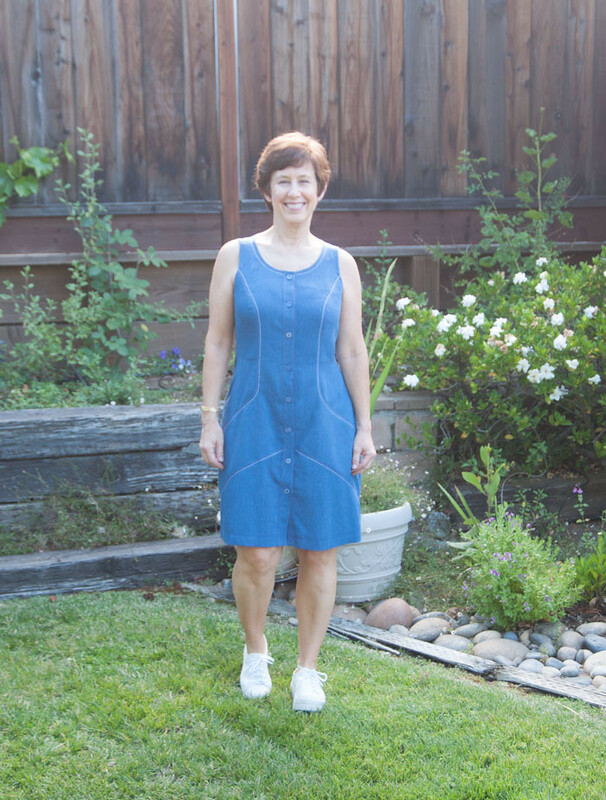 Thanks so much for sharing your new dress, you did an excellent job and I'm inspired to make it as well! Love it! I especially like the detail that the pink topstitching adds - I enjoy it when clothes have a surprise you can only see up close! It looks great from afar, when only the white topstitching is visible, but then you see the other and it's even better. Glad you found something you like in those French Burdas. Can't wait to see your version of the Vogue 1445. Love your dress! It's also one of my favorites in the June issue and of course, I want to make it in stripes. 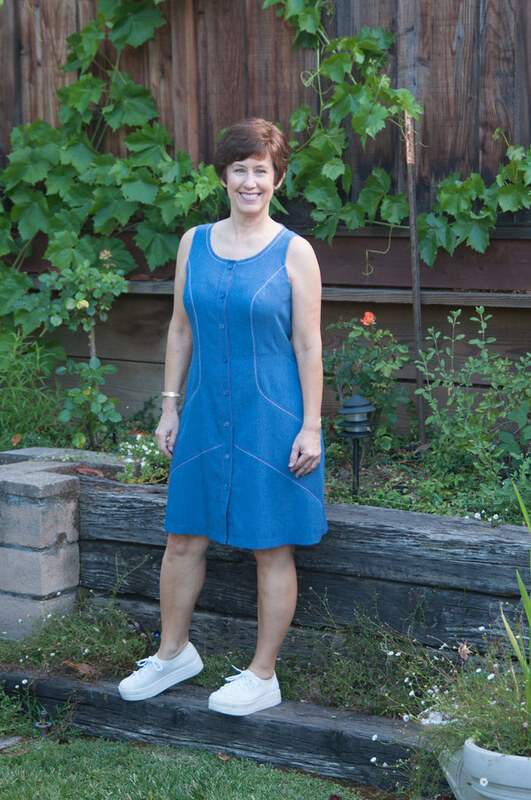 Hope to see you again at a Bay Area Sewists meetup one of these days! I've been waiting for the final dress too! Because of your IG pic, I bought the magazine. Don't know which I hate more but I'm gonna try tracing the pieces. This looks awesome on you and exactly the style I'm looking for this summer!